The 3-way load valves ESBE VTC 512 and 531 are designed to be used with solid fuel firing closed central heating systems (Bio-Tec, BioSolid, EKO-CK P, EKO-CKB P, CentroPlus, -/B…) and CAS water accumulators, in order to protect boilers from flue exhaust gas condensation. The ESBE VTC 512 and 531 valves enable operating temperature to be reached very quickly and subsequently to be maintained, by regulating the flow between the the boiler’s outlet to the central heating system and a return connection directly back to the boiler. The ESBE VTC 512 and 531 are connected to the system together with the circulation pump. ESBE VTC 512 is a 3-way control valve with external thread connections. 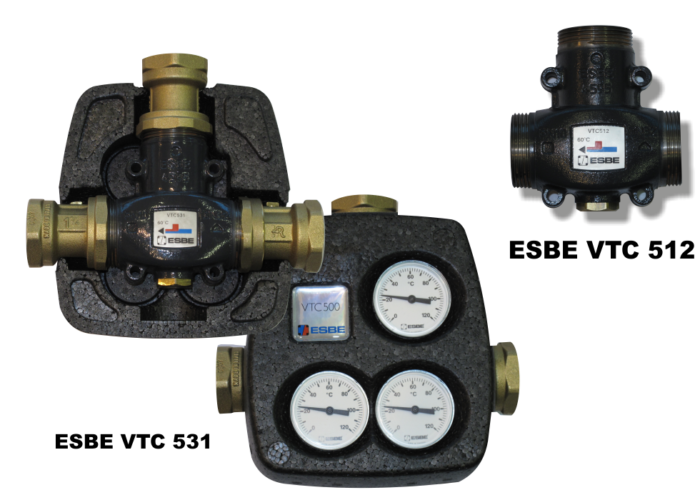 ESBE VTC 531 is a 3-way control valve with 3 stop valves and internal thread connections, a pump connection, 3 thermometers and insulation. They are connected to central heating systems with solid fuel firing boilers together with CAS water accumulators. The boiler temperature is min. 60°C, which protects it from the condensation of flue exhaust gases. The built in thermostat begins to allow hot water to pass out of the outlet when the boiler temperature reaches 60°C. If the boiler temperature is below 60°C the pump turns back the water from the outlet to the inlet through the VTC valve shortcut. The circulation pump has to be chosen according to the boiler capacity, i.e. according to the recommended pump list.